Dsquared jeans have a black rectangular fabric tag sewn inside the waistband. The label should be sewn on the wearer's left side of the waistband (the right side if you're looking at the jeans straight-on). These tags are not sewn in the center of the back like many other brands. This tag measures 2.25 inches long and just a hair over half an inch tall. The fake versions of these labels vary a bit in size and shape and are often sewn in the center of the back of the waistband. In the example above there are two key distinguishing factors between the real label and the fake label. The first is the stitching around the edges. The stitching should be straight and parallel to the edges of the fabric. As you can see in the fake, the stitching is further from the edge than it is in the authentic label. The second thing to note is the size of the text in relation to the label. In this example the fake text is larger. This one is pretty obvious. Not only is the stitching crooked, but the label is cut crooked, the letters are too large, they are located up a little too high, and the label is the wrong proportions (too short). Furthermore, if you look closely you can see that on the fabric content tag of the fake jeans it reads: "Made in Hong Kong." Well, I don't think I have to tell you that authentic Dsquared jeans are not made in Hong Kong. These fake labels range in quality so keep an eye out. 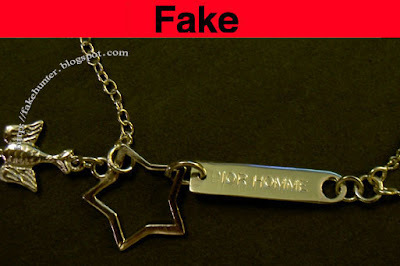 The vast majority of Vivienne Westwood jewelry on eBay is fake. To avoid getting ripped off you need to know what to look for. Below is a real v. fake example of the three-hinged armor ring. This ring is made in two versions, the silver (925 silver) and the gold version (which is gold plated 925 silver). What you should look for is the quality of the casting (edges, detailing, etc) and the quality of the metal. The fakes can sometimes have a lot of grainy imperfections in the metal, and poorly shaped edges. In the second comparison above you can see the lack of quality in the casting of the orb logo on the fake ring. It looks like it is actually cracked at the base, which may be from a poorly applied 'gold' paint job. When shopping online it can help to have a photo of the item (in addition to the ones provided in the auction) from a reputable source so that you can compare any differences. Granted, this is not always easy to get, which is one of the reasons I started this blog. In the above example you can see that the links of the fake ring are shaped a bit differently. The real ring's links are also stepped, not aligned in a straight line. See what I mean? Another difference with this style ring is the hinging mechanism. The fake one has larger ball cap joints, where as the real one has small rounded prongs sticking through the holes. Remember to always check the seller before buying anything. Look at the feedback and the other items he/she has sold. Designer jewelry rarely gets discounted so if the seller has sold a large amount of a particular style piece it should be a warning sign. A lot of the Dior Homme jewelry that pops up on eBay is fake. One of the best ways to determine authenticity from the photos is by the quality of the lettering on the jewelry. Fake Dior Homme jewelry often has crooked or misaligned lettering on it. Below are a few examples but this information can apply to all pieces. The jewelry can often be hard to authenticate because much of it is fairly simple and easy to reproduce. The key (of course) is in the details. Ask the seller for large, clear, close-up pictures so that you can evaluate the details and quality. With the 'three bee' leather rope necklaces above you can see the variation in the engraving of the CD on the bees. In this example the fake CD's are slightly offset to the right. Also note that the lettering is larger than the real one. In the example above the D is only partially there and the lettering is crooked. If you enlarge the picture (click on it) you will also be able to see the poor, toy-like quality of the metal and craftsmanship. Here are some more details. As with all fakes, the quality is pretty low. Note the uneven thickness of the edges of the star. Many pieces of Dior jewelry have this "CD | PARIS" bar. If it does you should note where the clasp is attached. If you look closely in the photo above you will see that the authentic necklace's clasp is attached to the chain side and not the "CD | PARIS" bar side. The fake necklace often have the clasp attached to the end of the bar. So, the authentic ones hook from the chain to the bar, and the fakes often hook from the bar to the chain. There haven't been any posts for a while because I've be out of town a lot, but now that's over for a while so I will continue updating on a fairly regular basis. I've had a couple requests for specifics on Dior Homme accessories, specifically jewelry, so I will start putting some postings together for that. If you have a request for a posting topic, feel free to submit it.